On Sundays, the Jam and Toast groups provide Bible-based activities for two different age-groups for part of the 9.30 am service. For babies and toddlers, Children’s Church at 1.30 pm on Thursdays provides a service specifically tailored to the needs of this age-group. 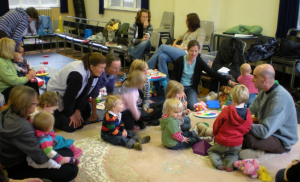 On Mondays, the Jack & Jill’s Toddler Group meet at 9.15 – 11.15 am in St Mary’s Centre. St Mary’s also has four uniformed groups that meet in St Mary’s Centre.